June 25 (Bloomberg) -- Denso Corp., Japan's biggest auto parts maker, said employees agreed to return to work at a Chinese factory after a strike that has disrupted Toyota Motor Corp.'s production in the country. Toyota, the world's largest carmaker, aims to restart a plant in Guangzhou early next week after the walkout at Denso's plant in the southern Chinese city forced it to shut down, said Liu Peng, a spokesman for the automaker in Beijing. At least eight strikes in the past month have forced suppliers to Toyota, Honda Motor Co. and Nissan Motor Co. in China to raise wages, increasing the carmakers' production costs in the world's largest automobile market. Pressure for higher pay is rising as workers demand a greater share of the benefits of economic development, said Bill Russo, a Beijing-based senior adviser at Booz & Co. The workforce "has not been benefiting or participating in that development through the ability to consume the goods they are producing," Russo said. "That imbalance has to be corrected." Sadayoshi Yokoyama, a spokesman for Aichi, Japan-based Denso, said talks over wages continue with the workers who struck at the Guangzhou factory, even as they have returned to the production lines. For the first time, Booz & Company has topped the field in the magazine’s annual survey among strategy consulting firms in China, from which the passage above is taken. Also, Booz & Company ranked as China’s #2 in a survey of consulting firms with a capability to advise on organization structure. In both cases, the firm bested competitors that have been in China for considerably longer. Cainey credits the hard work and dedication of partners and staff for the honor. It underscores a number of recent marketplace and Intellectual Capital successes for Booz staff who are a part of three offices in Greater China—in Shanghai, Beijing and Hong Kong. Drawing the most attention—and headlines—is the new book by Senior Partner and Chairman for Greater China Edward Tse, The China Strategy: Harnessing the Power of the World’s Fastest-Growing Economy, which outlines a “one-world” approach for companies, and gives them a comprehensive roadmap to move their China strategy up a level. Published in March by Basic Books, The China Strategy is the right book for the right time, essential reading for doing business in this dynamic market of more than 1.3 billion people where Booz & Company is making a real difference and winning clients. To date in 2010, the firm has started strategy engagements, at, among others, Boler, Chang’an, Chemchina, Geely/Volvo, Modine, Merck, Minth, Pfizer, PTT Chemicals, SAIC, Shanghai Government and the SK Group. Small wonder that Booz & Company people have become the go-to experts quoted regularly in the press, particularly Senior Advisor Bill Russo, a sought-after source from major publications on the Chinese auto industry. Much of the press attention has been triggered by a continuous stream of influential studies and IC, including the Booz & Company/American Chamber of Commerce in Shanghai (AmCham Shanghai) China Manufacturing Competitiveness Study; Bessler and Principal Stephen Li led the Booz & Company team. For the 3rd-annual Study, Booz & Company and AmCham Shanghai incorporated a combination of online surveys and focus groups to survey 202 foreign-invested manufacturing companies about their perceptions of China as both a sales market and production center for domestic distribution and exports. The survey helped gain a better understanding of how companies are managing the new and still-changing business environment—which has continued to expand, albeit at a slower rate, through the global economic downturn. 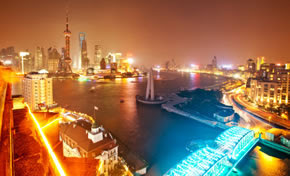 Elsewhere, the recent Perspective, Going to Market in China: How Consumer Goods Companies Can Find Optimum Profits in the New Consumer Marketplace, co-authored by Bessler, Principal Adam Xu and Partner Jose Gregorio Baquero, suggests that companies in China increasingly will want to consider more direct distribution and more exclusive third-party distribution approaches. Meantime, Cainey’s Perspective, Shanghai - Building an International Financial Center with Chinese Characteristics, takes a penetrating look at how Shanghai will be able to meet its goal of becoming an international financial center by 2020, as the State Council intends. For Tse, the many new engagements and the Manager Magazine recognition is the best evidence yet that Booz & Company has what it takes to succeed in China’s dynamic market. “The intensity and scale of change in China means that all businesses, even those that are currently successful, will find themselves inadequately prepared for the opportunities, dynamism, and challenges to come,” he says.